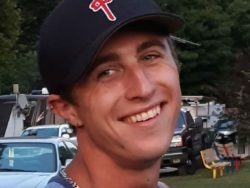 Zachary McCullough - Heritage Funeral Homes Inc.
of Arthur passed away suddenly on Tuesday, January 8, 2019 at the age of 25. Dear son of Randy McCullough and the late MaryAnn (Greco) 2018. Cherished brother of Victoria McCullough (Dave) and Caleb McCullough all of Arthur and stepbrother of Amber McCullough. Uncle of Maddison, Brayden and Ella. Special Grandson of Dorothy McCullough and the late Marv McCullough and Leroy Keith of P.A, U.S.A. Sweet Nephew of Rick McCullough and Rhonda McCullough (Andy), Frank Greco, Amy Byers and Joe Greco, Fondly remembered by his many cousins and friends. The family will receive friends at the Crawford Funeral Chapel, 243 George Street, Arthur on Friday, January 18, 2019 from 2 to 4 and 6 to 8 p.m.
A celebration of life will be held at the Arthur Royal Canadian Legion Branch # 226, 281 George Street, Hwy 6, Arthur on Saturday, January 19, 2019 at 1:00 with remembrances at 1:30 p.m.